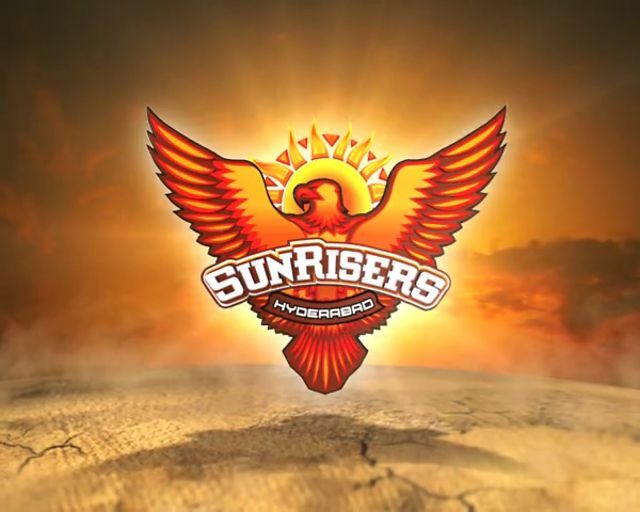 By the time you will read this post, Sunrisers Hyderabad (SRH), which is participating in the tournament for the first time, will be on its way back home. The team, which came into existence when The Sun TV Network won the bid after Deccan Chargers was sent packing by BCCI because of the payment issues, has done well in the first season itself by making its place in the top four teams of the tournament. It is a fresh start for Hyderabad, which won 2009 championship when it was Deccan Chargers, and it is a suitable time to analyze its social media activity and see if it has carried the good work off the field, on the social media as well. 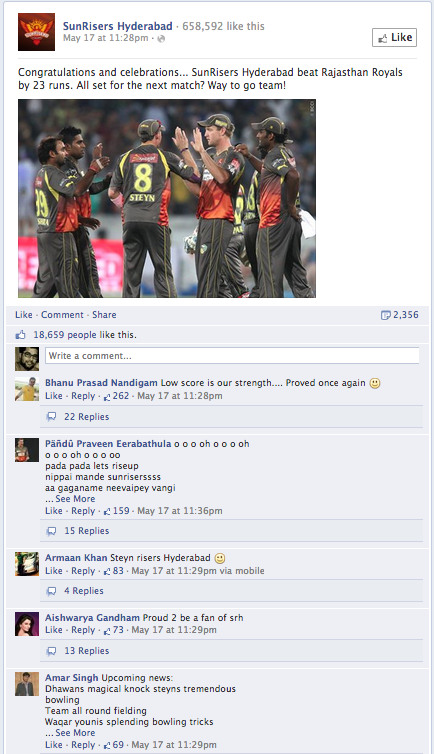 One look on Facebook timeline of Sunrisers Hyderabad will tell you how strong the brand has become in the course of less than six months. The engagement level of the page is at par with teams like Kings XI Punjab, in fact, it has surpassed all teams in this regard. Fans of Sunrisers happen to make an average comment thread pretty long by not only posting a reply to the post, but by posting multiple replies to replies on the post and liking the replies of other users (see the following images to understand what I mean). 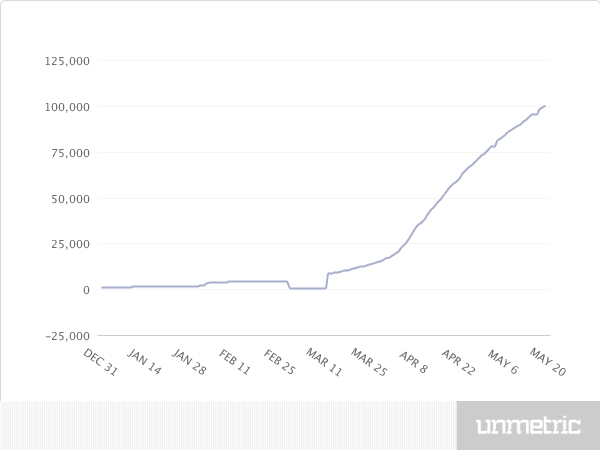 As the Facebook page of SRH is pretty new, almost all the fans of the page were gained during the studied period. 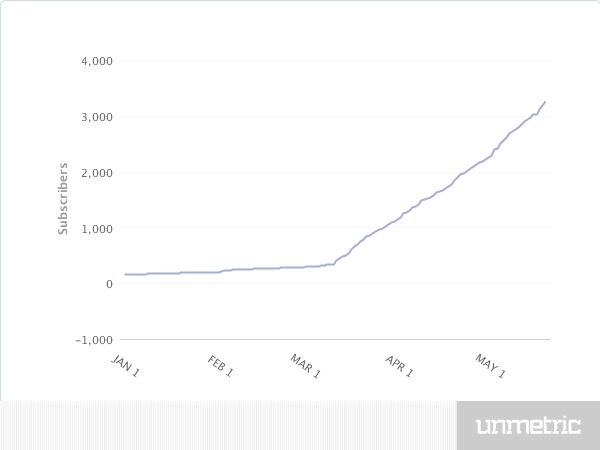 In total, the Sunrisers has 657,271 fans, of which 644,685 fans were gained in the studied period (including 245,622 fans which were gained in the warm-up period). These numbers are highest for any IPL team, one of the reasons behind this is that the page was new so had a great potential to grow quickly, which it did. 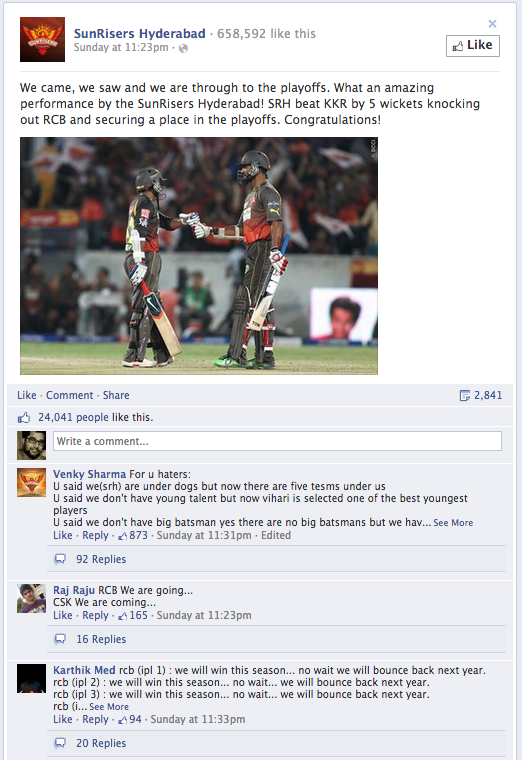 Like KXIP, the posts on SRH’s wall are almost entirely about the matches the team played, but still they happen to generate a lot of buzz. 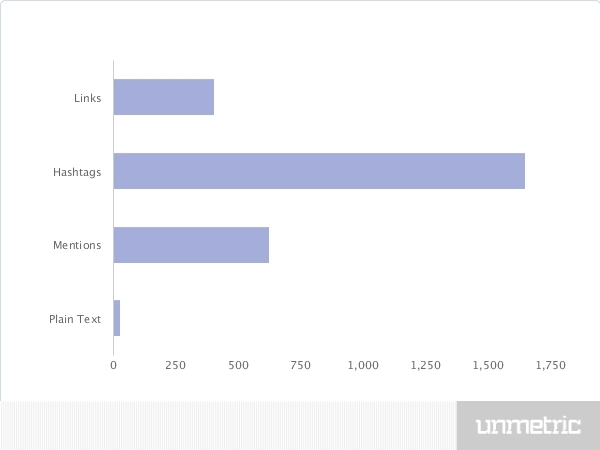 For example the following two posts have not only gained many likes and shares, as evident in the screenshots, but also gained 1939 and 1458 comments respectively. Some occasional videos were also posted on the page, but apart from that there appears to be no more variety in the nature of posts on the timeline. 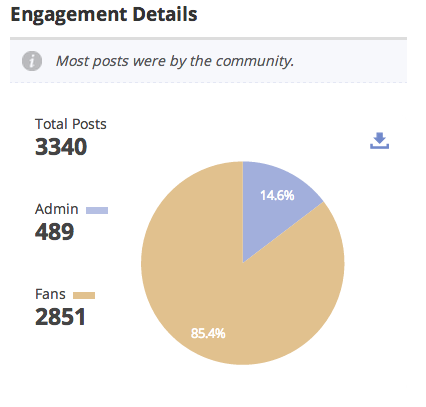 In total, 3340 posts were made in the studied period, of which admins did 489 (14.6%) posts and the page’s fans did the rest 2851 (85.4%). 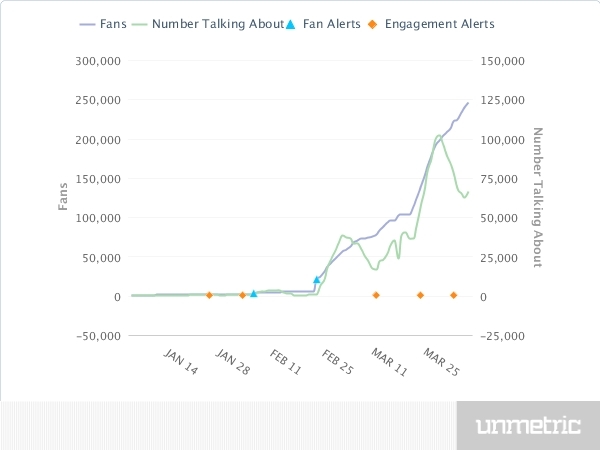 In terms of page’s active engagement, the page saw as many as 172,579 people talking about it between April 10, and April 20, 2013. This numbers stood at 94,365 at the time of writing. 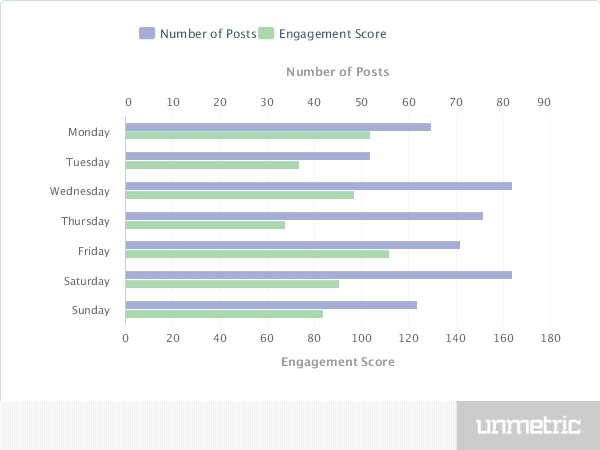 Engagement level on SRH post remained decent throughout the week, based on unmetric’s engagement score, and the posts accompanying the level had also been good enough. 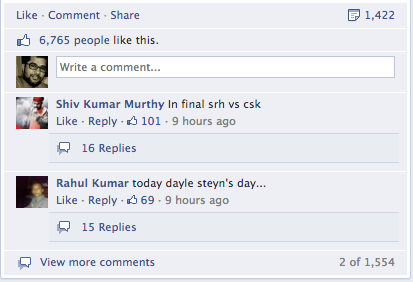 The team, though, needs to work a little harder on the quality of posts to drive the engagement higher on all days. Seeing the level of engagement that SRH enjoys on Facebook, it looks very much natural that the page’s admins demonstrate some emotions in the posts, and what emotion could be better than the positive ones? 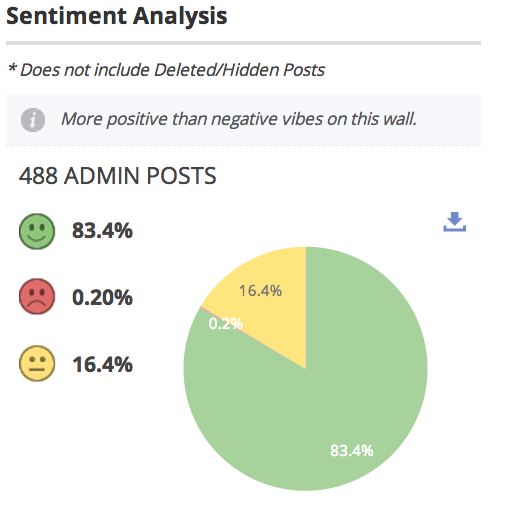 The posts display positive sentiment 83.4% of times, which is the highest for any team, and 16.4% wear a neutral mask, whereas, in 0.20% of posts admins have shown frowning face. 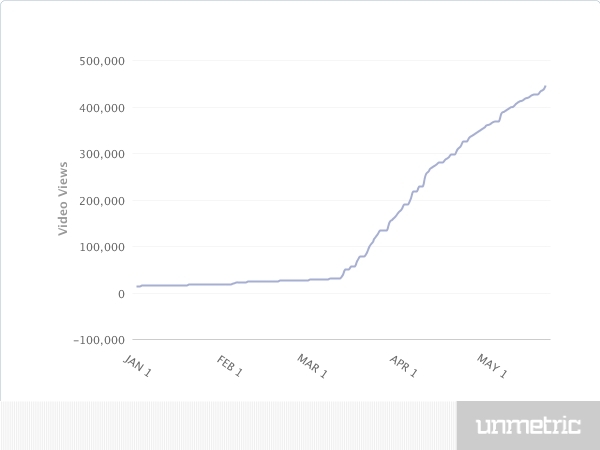 With 102,609 followers, of which 99,151 followers were gained since the beginning of the warm-up period, (7,184 fans of which were gained in the warm-up period), Twitter stream of Sunrisers Hyderabad is on fire. 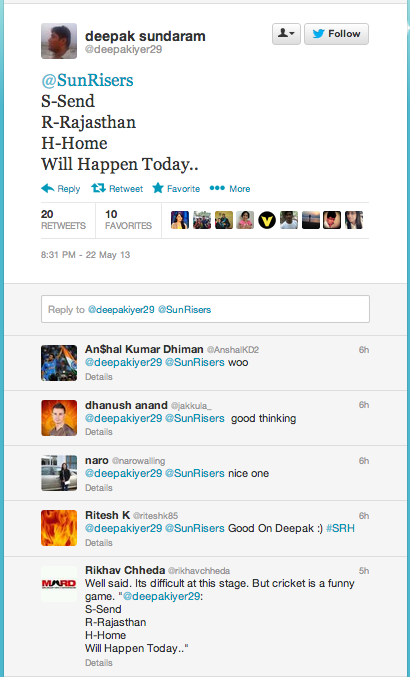 Followers have actively participated in the discussion on the page and have used team’s hashtag (#srh) in very unique ways (see the third image). The conversation threads on twitter has not challenged that of Facebook, but there had been some pretty engaging discussion on the page (see the first and the second image). The team has made a good use of twitter stream by posting images to engage people. This content strategy has not been employed by all of the IPL teams, at least not with the frequency that SRH has adopted. 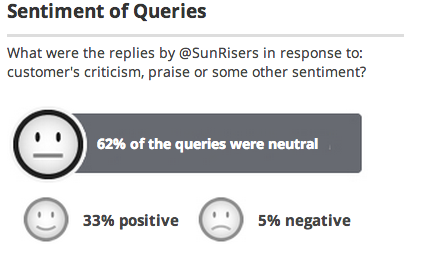 In the studied period, the Sunrisers has tweeted 3,498 times, of which 63% of were proactive in nature, 28% retweets, and 10% replies (see the image below). This is an almost balanced approach to tweeting, but it’d have been much better if the percentage of replies had been higher. 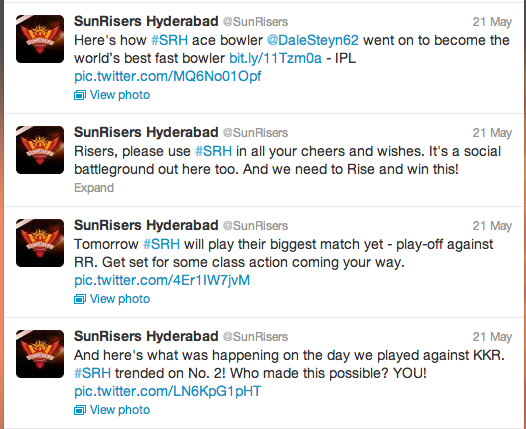 In terms of proper use of various elements in its tweets, Sunrisers Hyderabad has done better than most of the IPL teams. Its proactive tweets had used all the elements properly, except plain text which works to influence click-through. The team has appropriately used the hashtags (#SRH, #IPL), but the frequency of links in proactive tweets should have been higher. 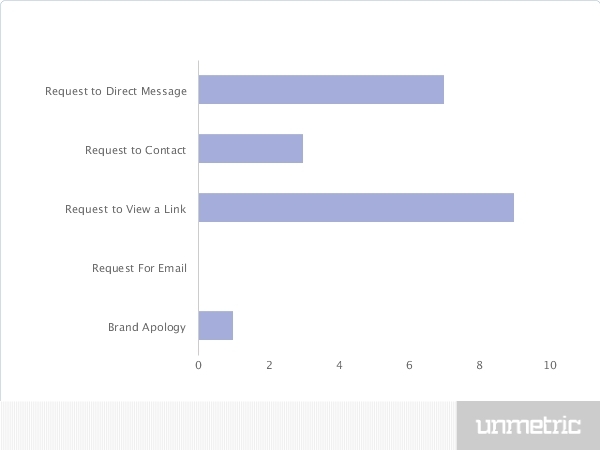 Construction of replies looks much better than that of proactive tweets. The elements have been properly used, as evident from the image below. 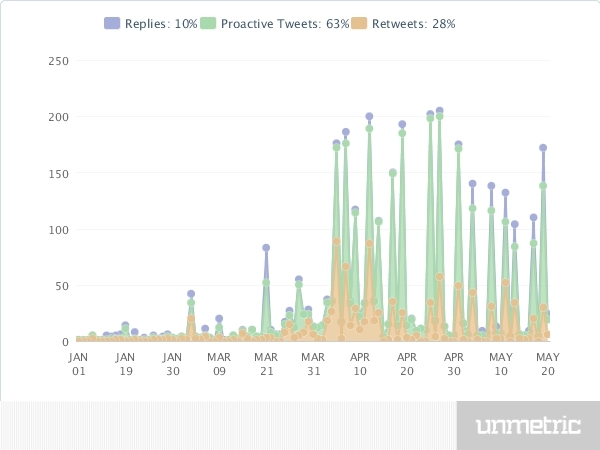 As far as the timing of twitter activities is concerned, the team had been active on the platform all through the day, except between 3am and 6am, and understandably so. 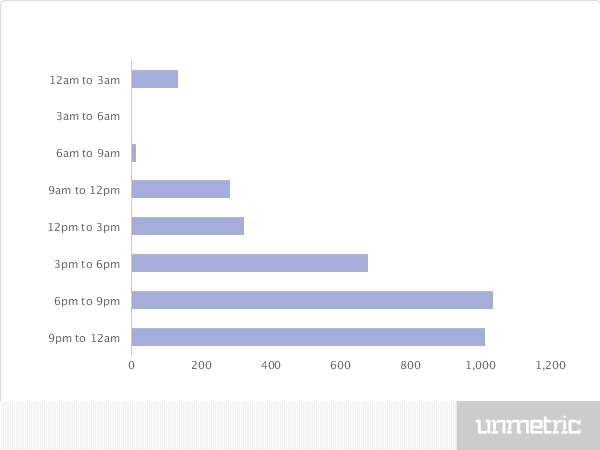 Twitter activity on SRH stream begins at a modest pace between 6am and 9am only to see a sharp rise between 9am and 3pm, from where the activity continue to rise until between midnight and 3am. The first thing that I noticed was the high level of negative sentiments (5%) flowing on the SRH’s twitter stream, but then 33% tweets with positive sentiment worked to balance it. The rest were neutral in nature. On YouTube SRH has done a far better job than other IPL teams, except Royal Challengers Bangalore and Rajasthan Royals. In the studied period, the team has uploaded 27 videos and gained 431,465 new views and 3,101 new subscribers. Even the rate at which new subscribers and video views have been gained has been good enough with almost a flat growth-rate for both before March 12, 2013, and a sustained growth since then (see the second and the third images). Most of the videos posted by Sunrisers Hyderabad on its YouTube Channel has been around things other than the matches they played, which is a good sign, and the length of an average video was around 30-40 seconds, with occasional videos touching (or going pass) the one-minute mark. Along with videos of casual moments of the players or the team, as you can see in the first video where Dale Steyn is getting his hair cut, SRH has posted videos of making of its official anthem (see the second video). The team has also created an official video (see the third video). Nothing appeared in the search I conducted to find out the official Pinterest and Google+ profiles/pages of Sunrisers Hyderabad to suggest that the team doesn’t have any such profiles/pages on the said platforms. There was one profile on Google+, but the URL linked to the page took me to a third-party website, so it was hard to be sure if that was an official Google+ page. It looked unlikely, though. 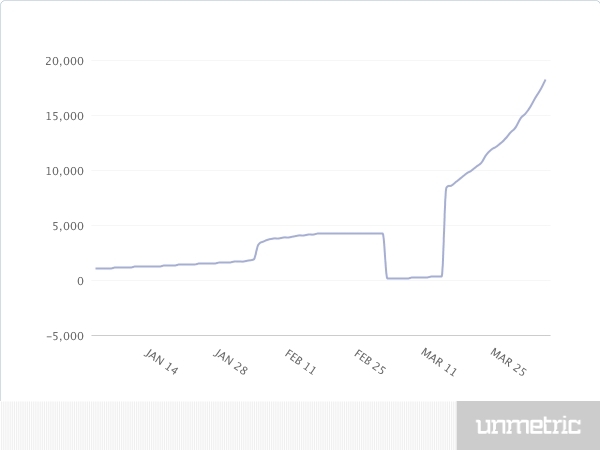 As the page was launched in December 2012, the growth potential of the page was huge, which the page has successfully capitalized on by gaining the number of fans it did and by causing so many active discussion, but this is not all to social media. The page needs to have some good content to sustain at the level it has reached, which unfortunately it lacked. Sunrisers Hyderabad needs to work on its content strategy and add variety to its posts. On Twitter, SRH has done more or less similar job than that of other IPL teams, and here again, like on Facebook, the team fell short in adding variety to its tweets. 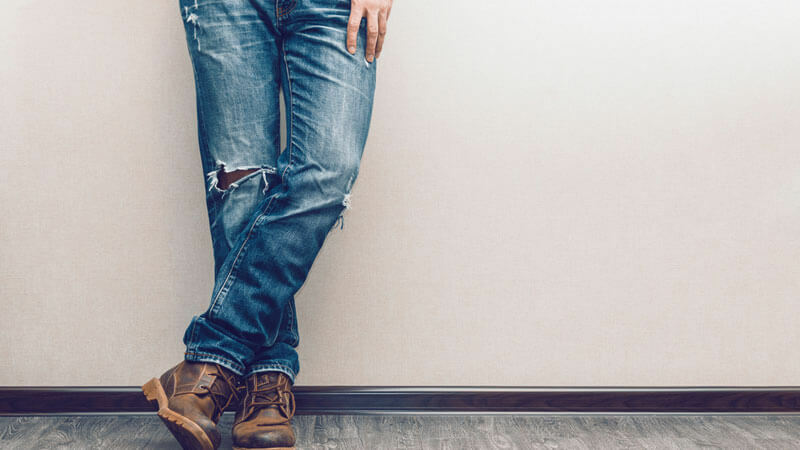 The lack of interactive tweets, quizzes, and contests was evident in less than optimal participation by followers in the conversation stream. 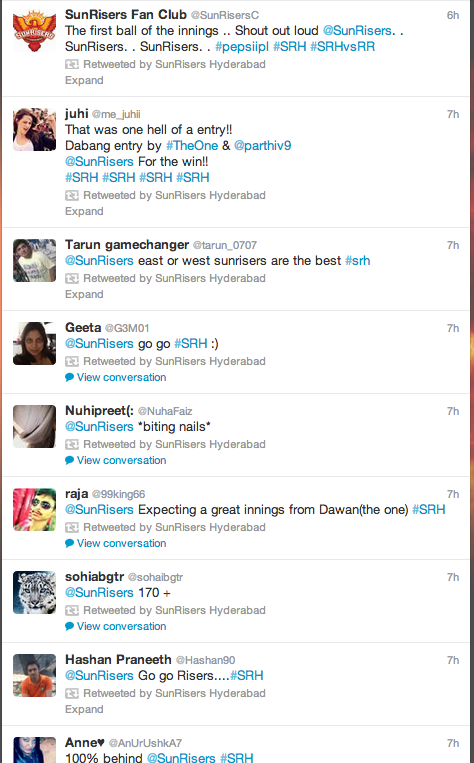 The team also missed out on creating multiple hashtags along with the team’s hashtag (#srh). The length of videos posted on YouTube should have been a little longer, other than that SRH appears to do things right on the platform. 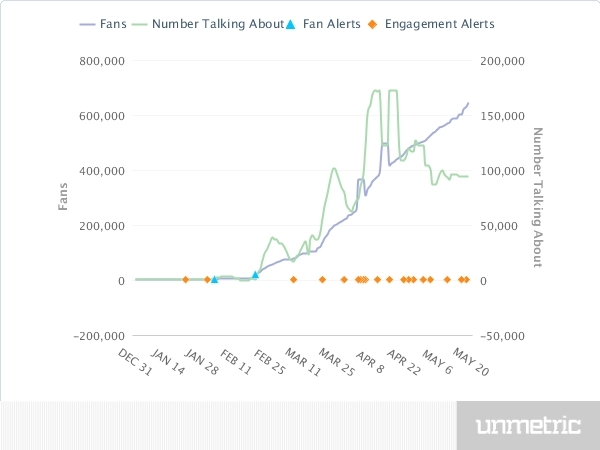 But like other teams, Sunrisers has Hyderabad also missed out on using videos created for YouTube to drive engagement on Facebook and Twitter. In this department, I saw yet another team wasting its valuable content. Yet another team to leave Pinterest and Google+ untouched. 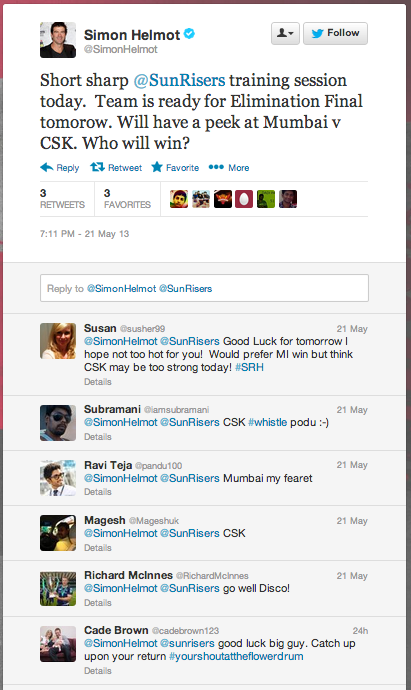 This is a common mistake shared by most of the IPL teams. Hopefully they will revisit their decision in the next version of the game.